Mike has been at Music & Arts since June of 2002. Mike studied at the world renowned Drummers Collective in N.Y.C. under the instruction of Steve Smith (Journey), Jim Chapin, Sean Pelton (SNL), and spent two years in Boston studying with drum guru Gary Chaffee. He has 15 years of experience teaching students that have gone on to Berklee College of Music, Chester County Youth Orchestra etc. Students are taught all rudiments, reading, technique, and styles so they have a strong foundation. Mike also customizes his teaching to achieve students’ goals and aspirations. Mike uses music to reference exercises, metronomes, and slow-down software to help students to learn effectively. Mike also uses his 15 years experience from playing in top working bands such as The Fuzzy Bunny Slippers, Steamroller Picnic, Karma, Big City and his current band Title Shot to teach the students how to be great, well-rounded musicians. 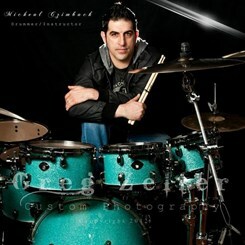 Mike is endorsed by Sabian Cymbals, Promark Drumsticks, and Evans Drumheads.